The reverse phenomenon, H-insertion or H-adding, is found in certain situations, sometimes as a hypercorrection by H-dropping speakers, and sometimes as a spelling pronunciation or out of perceived etymological correctness. In Old English phonology, the sounds [h], [x] and [ç] (described respectively as glottal, velar and palatal voiceless fricatives) are taken to be allophones of a single phoneme /h/. The [h] sound appeared at the start of a syllable, either alone or in a cluster with another consonant. The other two sounds were used in the syllable coda ([x] after back vowels and [ç] after front vowels). H-dropping occurs (variably) in most of the dialects of the English language in England and Welsh English, including Cockney, West Country English, West Midlands English (including Brummie), most of northern England (including Yorkshire and Lancashire), and Cardiff English. It is not generally found in Scottish English or Hiberno-English. It is also typically absent in certain regions of England, including Northumberland and East Anglia, although it is frequent in the city of Norwich. H-dropping also occurs in General Australian, most of Jamaican English, and perhaps elsewhere in the Caribbean English (including some of The Bahamas). It is not generally found in North American English, although it has been reported in Newfoundland (outside the Avalon Peninsula). However, dropping of /h/ from the cluster /hj/ (so that human is pronounced /'juːmən/) is found in some American dialects, as well as in parts of Ireland – see reduction of /hj/. Some English words borrowed from French begin with the letter ⟨h⟩ but not with the sound /h/. Examples include hour, heir, hono(u)r and honest. In some cases, spelling pronunciation has introduced the sound /h/ into such words, as in humble, hotel and (for most speakers) historic. Spelling pronunciation has also added /h/ to the British English pronunciation of herb, /hɜːb/, while American English retains the older pronunciation /ɝb/. Etymology may also serve as a motivation for H-addition, as in the words horrible, habit and harmony; these were borrowed into Middle English from French without an /h/ (orribel, abit, armonie), but all three derive from Latin words with an /h/ and would later acquire an /h/ in English as an etymological "correction". The name of the letter H itself, "aitch", is subject to H-insertion in some dialects, where it is pronounced "haitch". haunt aunt ˈɑːnt With trap-bath split. Processes of H-dropping have occurred in various languages at certain times, and in some cases, they remain as distinguishing features between dialects, as in English. Many Dutch dialects, especially the southern ones, feature H-dropping. 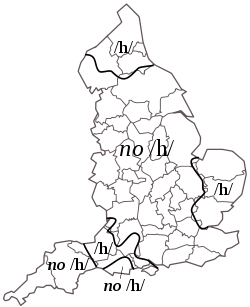 The dialects of Zeeland, West Flanders and North Brabant have lost /h/ as a phonemic consonant but use [h] to avoid hiatus and to signal emphasis, much as in the H-dropping dialects of English. H-dropping is also found in some North Germanic languages, for instance Elfdalian and the dialect of Roslagen, where it is found already in Old East Norse. Loss of /h/ has also occurred in some Serbian dialects. It is hypothesized in the laryngeal theory that the loss of [h] or similar sounds played a role in the early development of Indo-European languages. ↑ David D. Murison, The Guid Scots Tongue, Blackwodd 1977, p. 39. ↑ Milroy, J., "On the Sociolinguistic History of H-dropping in English", in Current topics in English historical linguistics, Odense UP, 1983. ↑ Milroy, L., Authority in Language: Investigating Standard English, Routledge 2002, p. 17. ↑ Upton, C., Widdowson, J.D.A., An Atlas of English Dialects, Routledge 2006, pp. 58–59. ↑ Collins, Beverley; Mees, Inger M. (2002). The Phonetics of Dutch and English (PDF) (5 ed.). Leiden/Boston: Brill Publishers. pp. 290–302. ↑ Wells, J.C., Accents of English, CUP 1982, pp. 564, 568–69, 589, 594, 622. ↑ Wells (1982), pp. 254, 300. ↑ Wells (1982), p. 322. ↑ Wells (1982), p. 254. ↑ "World of words - Oxford Dictionaries Online". Askoxford.com. Retrieved 2013-08-01.